Daniel Dabek is a software developer from New York and co-founder of the Safe Exchange, a decentralized marketplace for digital assets and physical goods. During Bitcoin Wednesday on 4 May 2016, he will present his solution for a resilient, serverless marketplace that cannot be compromised through hacking and which is resistant to government surveillance. His presentation will cover marketplace anonymity and preventing third party interventions that risk undermining regular trade activity. He will also discuss what legitimate marketplaces will likely look like in the near future. Daniel dropped out of college at Fordham University in New York City after only 6 weeks. Instead he went straight to work for a Wall Street trading company where he became acquainted with electronic trading markets and business strategies. His passion for software engineering emerged when he decided that manually trading electronic markets was not ideal, and began to consult for U.S.-based hedge funds. His work involves scientific computing, natural language processing, peer-to-peer networking, distributed price analysis modeling, and prediction algorithm optimization. He has produced several trading execution algorithms and price following systems that are still in use today. 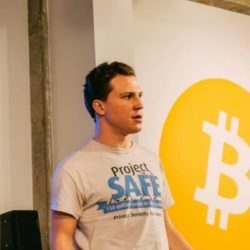 Daniel’s professional interest in cryptography led him to Bitcoin, and subsequently, MaidSafe and its SAFE Network. Seeing the ramifications for the world, he turned his attention to the development of the Safe Exchange, a decentralized asset exchange that affords privacy, security, and freedom to its participants. Daniel’s service, the Safe Exchange, is an application built on the encrypted data storage and communication platform called the SAFE network, a distributed platform developed by MaidSafe. In his spare time Daniel thoroughly enjoys playing tennis and visiting nature especially high elevations to better see the stars.